On Sunday, while sitting at the top of one of the hills at Woodsom farm in Amesbury, MA, I noticed to my left a bench. Now, I have been to the top of this hill and all around the hills of Woodsom before but never saw this bench, just parked at the top of the hill, situated where if you are sitting on it, you will have a scenic view of the whole farm and area – truly magnificant (as shown below). My son and I sauntered over to the bench and we noticed that there was an engraving on it. 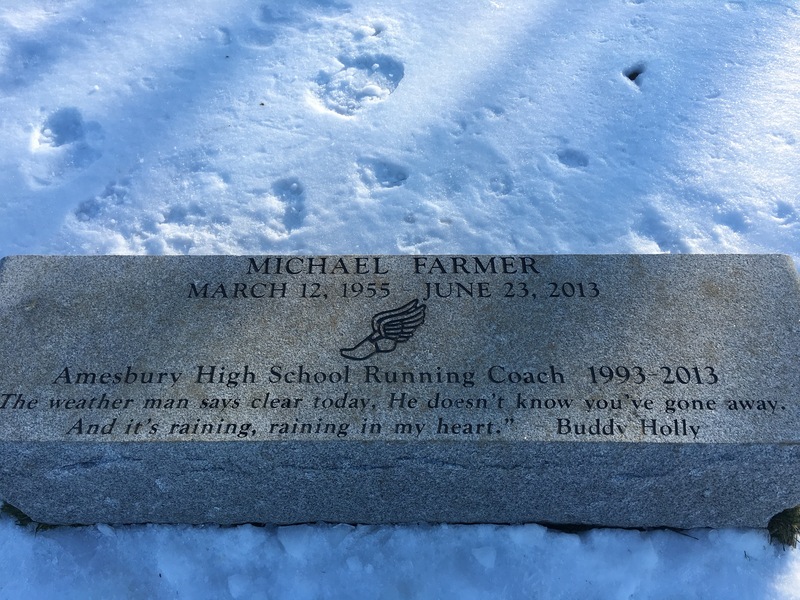 As it turns out, this bench was placed at the top of this hill at Woodsom was placed there to keep the memory of Michael Farmer alive – the former track coach of Amesbury High School who passed a few years ago after fighting cancer. So who is Mike Farmer? As the picture above indicates, Mike Farmer was the Running coach at Amesbury High School from 1993 to 2013. In terms of coaches, as shared by others, he was a very good and influential coach, always trying to improve each member of the team as well as former members of the team who come back to the area l (this Facebook page as a ton of such mentions). Farmer would sit at the top of Woodsom during meets so he could get a view of the whole course – the pic below shows that – always at practice and at every meet. Some have said he was a “lifelong” runner who was passionate about the sport. One characteristic that many in the running world share is “passion.” The running fraternity is one unlike many other sports they I have participated in. Sure there is competition but the majority of runners are in the trail to do many things; lose weight, become more healthy, share experiences with others, etc. People will run 150 miles because they want to – not for fame or money. It is a sport that people do it for the “love of the game.” From every indication and anecdote, Michael Farmer was very much the epitome of the running community! As a coach (and one who was at the same High School from 2007 to 2011), I believe these are tremendously supportive comments to be sent in any leaders direction! I can only hope to emulate him as I guide kids in multiple sports and while running on the trails. Passion drove him and I hope to share in the same level of passion so that I can succeed in the future and affect others in a similar way. Previous Post Thinking Randomly… wearables, chats and marathons!